On her sophomore album Deluxe Hotel Room, indie-pop artist Lucette turns her title phrase into a metaphor for experiences both highly specific and widely familiar: fleeting romance, emotional displacement, isolation, the gulf between the presumed glamour of the artist's life and the reality of getting by. Produced by Grammy Award-winning singer/songwriter Sturgill Simpson at The Butcher Shoppe in Nashville, Deluxe Hotel Room unfolds in endlessly contrasting layers of feeling. "A lot of joy and a lot of pain has happened for me in hotel rooms," says the Canadian artist otherwise known as Lauren Gillis. "I've stayed in hotel rooms I'd never be able to afford myself and, unfortunately, I've been put in extremely uncomfortable situations in hotel rooms. Also, hearing about a lot of the pain women in the entertainment industry have been through in hotel rooms urged me to write the title track to this album." In keeping with a refusal to self-restrain, Lucette assembled a purposely iconoclastic sonic palette for the album. "A lot of the songs are very traditional in their roots, but Sturgill and I had this idea of producing them in a more pop-leaning way," says Lucette, who grew up on ABBA and names Rihanna among her main inspirations. "There's only one or two guitar tracks on the whole record, and instead of putting banjos or pedal steel all over the place, we did it up in a way that felt a lot more genuine to my upbringing and character." Born and based in Edmonton, Alberta, Lucette first began exploring her singular narrative voice as a teenager, drawing inspiration from artists as eclectic as Leonard Cohen and Blaze Foley and Amy Winehouse and Etta James. In especially formative moments, records like Joni Mitchell's Blue helped her cope with times of depression and made her appreciate her home, Canada. "At times, away from home, I could barely even get out of bed, and I remember the part in 'River' when she says, 'drew a map of Canada' and 'I wish I had a river to skate away on,'" Lucette recalls. "Those lyrics broke me but, made me appreciate my home." At age 19, Lauren made her debut as Lucette with Black Is the Color, a Dave Cobb-produced 2014 release featuring the acclaimed single "Bobby Reid." In addition to appearing in the "Bobby Reid" video, Simpson enlisted Lucette as the opening act on a 2014 tour in support of his album Metamodern Sounds in Country Music, bringing her captivating live set to venues across the country. Backed by Simpson's touring band, Lucette embeds Deluxe Hotel Room with so many unexpected flourishes: brooding drum-machine beats, luminous synth lines, and -- perhaps most strikingly -- the soulful saxophone work of New Orleans musician Brad Walker. Along with shining a new light on her gracefully sculpted melodies, the album finds Lucette bringing a previously unglimpsed boldness to her vocal presence. "The only direction Sturgill really gave me with the vocals was, 'Sing it like you mean it,'" says Lucette. "Because of that, I think you can actually hear what my voice sounds like for the very first time." After opening with the piano-led reflection of its title track, Deluxe Hotel Room drifts into the torchy intensity of "Out of the Rain" -- a song about the breakup that informed much of the album. "'Out of the Rain' came from experiencing freedom from such a negative relationship, and then having that feeling of freedom wear off while I was out on tour," Lucette explains. "It was bittersweet because I was doing exactly what I wanted to be doing, but I just felt alone and vulnerable and sort of bluesy about the whole situation." Threaded with fragile synth tones, "Out of the Rain" brilliantly magnifies that lonesome mood with a sublime saxophone solo from Walker ("Every time I hear that solo, it hurts my soul a little bit," Lucette notes). Although much of Deluxe Hotel Room wanders into heavy-hearted terrain, lead single "Angel" arrives as a heavenly piece of dream-pop driven by pounding piano riffs, bright drumbeats, and swirling, symphonic synth lines. "I was in a relationship that didn't last long, but felt like the first time where a relationship was fun and not work," says Lucette. "I wrote 'Angel' from a place of admiration and joy for being with someone so sweet and full of life." Throughout Deluxe Hotel Room, Lucette reveals the depth and scope of her songwriting, her ability to capture often-overlooked elements of the human experience. To that end, "Full Moon Town" spins an unsettling portrait of small-town living, while the sleepy, sax-laced "Fly to Heaven" and the shimmering "California" ruminate on escape and the afterlife. 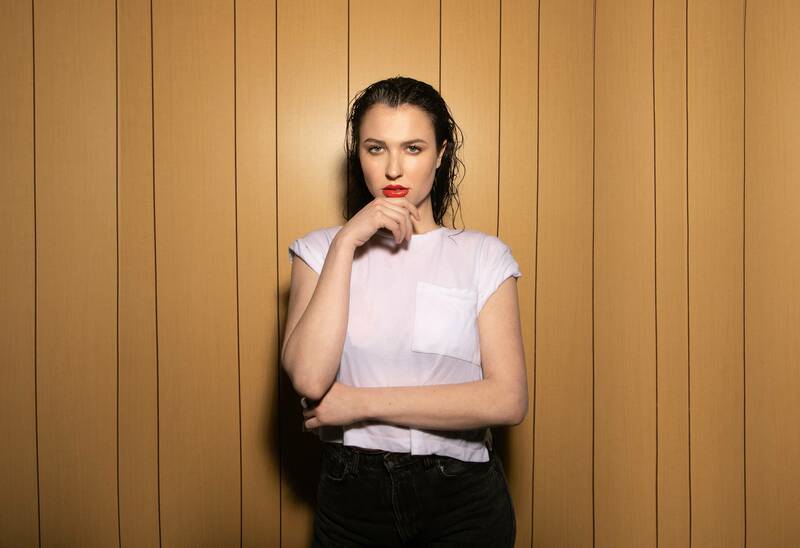 On "Crazy Bird," with its hazy textures and gospel harmonies, Lucette examines the uneasy thrill of falling for someone larger-than-life and impossible to pin down. One of the album's most gripping and epic moments, "Talk to Myself" is an intimate meditation on mental health, with Lucette's vocal performance both glorious and devastating in its determination. ("It's about my struggle with feeling sane sometimes, and how -- even when I feel like I'm losing it -- you'll never see me fully lose myself," says Lucette.) And on "Lover Don't Give Up on Me," Deluxe Hotel Room closes out with a stripped-back piano ballad that channels all the quiet grief in longing for a person who's emotionally impenetrable. In looking back on her path as an artist, Lucette observes a certain shift in her motivation to make music. "When I was a teenager, I mostly wrote songs because I wanted to have my voice heard," she says. "Now it's more cathartic, a way of telling people what my life's been like." But as Deluxe Hotel Room proves, her songwriting goes beyond confession to offer something of greater purpose: a sense of solidarity and solace for those who've endured similar troubles. "To me these songs are a way of getting through to anyone who's had problems with depression or anxiety or issues with their body and, letting them know they're not the only ones who feel lost sometimes," says Lucette. "Making the album helped me realize that my strength doesn't lie in how a partner or the public sees me -- it's about being open about mistakes I've made and things I've been through, and then moving forward with hope."